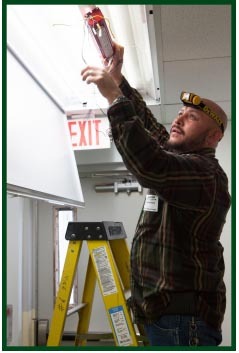 LMC is a full service maintenance provider and can support all of your organization’s facility maintenance needs. 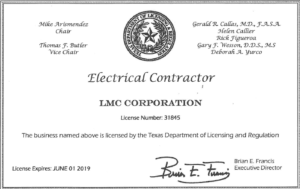 As well as being a Texas licensed electrician, LMC maintains a workforce of carpenters, painters, plumbers, roofers, door and window specialists, flooring technicians, gate and fencing servicemen, hardware specialists and supervisors. LMC can provide you with all of the maintenance personnel you need to maintain the pristine condition of your facilities. Unlike many of our competitors who simply broker their maintenance work to local subcontractors, LMC self-performs up to 70% of the work we do. Our in-house field personnel results in greater quality control, faster response time and value cost-savings that we pass on to our customers. Our ability to respond quickly and efficiently to our customer’s facility needs, whether they be routine or emergency, has made LMC the maintenance partner of organizations across the state. Let LMC build a maintenance service relationship with you.